In the face of renewed interest in High-Speed Rail (HSR) projects, Ohio is one of several states seeking federal funding to relieve pressure on aging, overburdened highway infrastructure by constructing passenger rail routes between major cities. 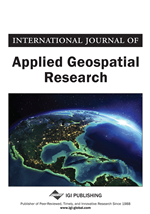 This paper evaluates the creation of a new rail route in Ohio’s 3-C Corridor utilizing GIS. The authors consider two primary cost factors in construction, slope and land cover, to generate alternative least-cost paths. To assess the importance of the cost factors, two separate paths are created using two different weighting methods for the land cover layer. The land cover is weighted first by difficulty of construction, and second by relative acquisition costs. These two paths are then compared against a path selected by the Ohio Hub Project which uses existing track lines, advantages and disadvantages of each are discussed. High Speed Rail (HSR) has earned widespread acceptance in Europe and Japan, but has been slow to catch on in the United States. Passenger rail in general declined during the era of interstate construction and expansion, and today is concentrated mainly on the East Coast, and radiating outward from Chicago in the Midwest. These two areas are connected by only a few routes, and other logical connections, such as the Cleveland-Columbus-Cincinnati (3-C) Corridor in Ohio, remain underserved. As pressure on existing highway infrastructure continues to build, finding alternatives to vehicle travel would seem logical. High Speed Rail (HSR) is considered to reference passenger rail systems travelling in excess of 125mph. In the US, the term is more typically used for trains travelling over 90mph (Federal Railroad Administration, 2005). The opening of Japan’s Shinkansen in 1964 proved to the world that HSR was a practical method of passenger transport. Since that time, HSR technology has continued to improve, attracting significant ridership in Japan and elsewhere (Nakagawa & Hatoko, 2007). Opponents of rail projects point to the high cost of constructing an entirely new infrastructure system, but the passage in 2009 of the American Recovery and Reinvestment Act (ARRA) has breathed new life into projects that have been shelved due to lack of funding. One such project is the Ohio Hub Project (OHP), which has commissioned several studies over the past decade or so to determine the feasibility of creating a rail hub, similar to that of Chicago, in Ohio and surrounding states (Ohio Hub Project, 2007). This collection of rail lines would link up the Chicago hub with the major corridors of the East Coast, as well as linking the cities of the 3-C Corridor with each other and with cities in neighboring states, such as Pittsburgh, Detroit and Indianapolis. It has also been argued that the revival of rail transit in the United States will bring a number of additional benefits, including availability of more environmentally-friendly travel (Rubin, Moore II, & Lee, 1999), and revival of historic downtown districts originally constructed around train travel (The Redevelopment Project at St. Pancras International Station, 2007). The reconstruction of train stations may bring only temporary employment, but the addition of permanent employment, such as hospitality jobs, are also appealing in terms of ARRA projects (House Committee on Appropriations, 2009). Of the significant amount of funds allocated for general improvement of transportation infrastructure, $8 billion of ARRA funds are expressly allocated for the development of high speed rail and passenger rail in general in corridors from Ohio to California (House Committee on Appropriations, 2009). Projects which are “shovel-ready”, that is, feasibility and routing studies have already been completed, will receive first consideration. The specific mention of Ohio in the text of the ARRA and the diligence of the OHP report emphasizing the benefits that HSR will bring to the state make Ohio a likely candidate for rail funding.